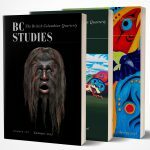 BC Studies is indexed in the Canadian Periodical Index, the BHA Index and is available online at bcstudies.com as well as in other online indexes. First published in the spring of 1969, BC Studies, a quarterly devoted to the understanding of British Columbia, has played a unique role in the intellectual life of the province. Housed at the University of British Columbia from its inception, BC Studies is a respected peer reviewed journal, an important publishing venue of original research from a diverse group of scholars, and a training ground for students. Through its focus on British Columbia, BC Studies provides a regional link between disciplines in the arts and social sciences, between larger analytical literatures and local archival collections, and between the scholarly community and passionate generalists. A typical issue contains four or five articles, twenty-five book reviews by authorities in the field, and a bibliography of books, articles, theses, and government publications on British Columbia. Articles are drawn from a number of fields including anthropology, archaeology, archival sciences, art, art history, demography, economics, education, First Nations and indigenous studies, gender studies, geography, history, linguistics, literature, museology, music, photography, political science, and sociology. BC Studies is currently co-edited by Leslie Robertson, a UBC anthropologist, and Paige Raibmon, a UBC historian. Previous editors include UBC historians (Margaret Prang, 1968-1983; Allan Smith, 1983-1995; Robert A.J. McDonald, 2002-2008), UBC geographers (Cole Harris, 1995-2002; Graeme Wynn, 2008-2016), a historian from UBC’s Faculty of Education (Jean Barman, 1995-2002), a University of Victoria political scientist (Walter Young, 1968-1983), and a British Columbia historian with a background in archaeology and historical geography (Richard Mackie, 2011-2016). By the sixties it was clear that the gap left by the demise of the British Columbia Historical Quarterly was too large to ignore and growing larger. Not only were there more students of British Columbia’s history in need of a magazine to publish their research, but economists, political scientists, geographers and anthropologists were also concerned about the lack of a regional publication. It was at this time that we decided to launch a journal that would both fill the gap left by the Quarterly and meet the needs of the other disciplines as well. We decided that the new journal should also be more than an outlet for purely academic articles; it should publish well-written material from any source that met the criteria of scholarly reporting. We determined then, and it remains our intention, that BC Studies should appeal to a wider readership than is assumed in the case of a purely academic journal. BC Studies’ original, peer reviewed articles on British Columbia’s social, cultural, political, and economic life, past and present, inform academics in many disciplines, legal practitioners, government officials, and businesses people alike, encouraging reflection and debate on important and controversial topics. Our editorial process ensures careful scrutiny of submissions and provides detailed guidance for revision, if necessary, and oversees the attractive, accurate publication of articles. By publishing solid, innovative articles, BC Studies ensures that its readers are informed of the results of current research. The journal provides an essential link between the production and consumption of research on British Columbia. The pressing contemporary intellectual challenge is to bring both the local and the theoretical into rigorous focus. Because it is often easier to ground oneself in theory than in the complexities of place, and because authors and readers of international and national journals are often detached from place-specific knowledge, such journals are not promising sites for working out a more equivalent balance between general theory and local intricacies. Regional journals can do better — as long as they write from the local out into the world. This is one of the tantalizing opportunities that underlies the best of BC Studies and sustains interest in the journal. Reviews of new books about, or with relevance to, British Columbia are also fundamental to BC Studies. Book reviewers are selected for their ability to draw out the larger meanings of books, and range from leading scholars to promising doctoral students from across British Columbia, Canada, and abroad. The ongoing bibliography of current books and articles is modeled on that published by the Canadian Historical Review and can be found in all regular issues and some theme issues. Specialists in all aspects of British Columbia, and librarians in particular, find this feature very useful, as it lists obscure articles and hard-to-find self-published books. Intermittent features include: Review Essays (reviews of books on similar topics that explore their larger significance), Photo Essays (collections of photographs with commentaries that introduce important topics and enhance the journal’s visual appearance), Case Comments (learned commentaries on particular court cases combining descriptions and analysis), and Forums (discussion and debate around important and controversial topics). Special theme issues have appeared regularly. Many of them have had lasting popularity and importance; an impressive cast of guest editors includes such notable scholars as Knut Fladmark, Wendy Wickwire, Jerry Wasserman, Lynne Marks, Henry Yu, and Nancy Turner. Eleven special issues are devoted to aspects of the First Nations of British Columbia. Six of these special issues (nos. 19, 57, 89, 101, 135, 152), focus on such varied topics as Native land claims, Indian Rights, fur trade relations, education, First Nations uprisings and politics, missionary activity, loss of language, potlatch law, Native art, writing, and fisheries, Aboriginal brass bands, museum policy, smallpox, dispossession, assimilation, reserve health, Aboriginal response to colonial settlement, and women. Other First Nations special issues deal specifically with colonialism (no. 115/116), courts and the treaty process (nos. 95 and 120), ethnographic practice (no. 125/126), Native geographies (nos. 138/139), and ethnobotany (no. 179). In addition, three issues are devoted solely to First Nations archaeology (6/7, 48, and 99). Special issues also indicate loci of expertise and enthusiasm in the several universities of British Columbia, with issues devoted to British Columbia’s economic issues (no. 13); Pacific connections (no. 156-57); environment (142/43); aquaculture (no. 150); historical geography (no. 94); park history (no. 170); the province’s north (no. 104); the Okanagan (no. 168); the economies and geographies of the middle Fraser (no. 160); politics, government, and planning (nos. 102, 124); the Court of Appeal (no. 162); labour, work, and welfare (nos. 103 and 118); teaching and education (no. 107); cultural history (no. 97); theatre history (no. 137); photographic history (no. 52); childhood and youth (no. 144); women’s history and gender studies (105/106); domestic spaces (no. 140); Vancouver’s social history (no. 69/70); the work and influence of the historian Margaret Ormsby (no. 32); and an editorial field trip to BC’s interior (no. 131). In 2012, Graeme Wynn and Richard Mackie edited Home Truths: Highlights from BC History, a collection of eleven articles drawn from the first forty years of BC Studies detailing the course of BC history from the dispossession of First Nations peoples to the creation of new colonial homes. Published by Harbour Publishing, Home Truths was on the BC Bestseller list for four weeks in the spring on 2013. BC Studies is supported by the University of British Columbia, Simon Fraser University, University of Northern British Columbia, University of Victoria, and Vancouver Island University. In 1971 it obtained the support of the Canada Council, and subsequently of SSHRC — the Social Sciences and Research Council of Canada — whose continued support is invaluable.